Two-vehicles collided at the intersection of Glengyle Dr. and McEvoy Rd., November 9, 2018. Photo courtesy of Strathroy-Caradoc police. 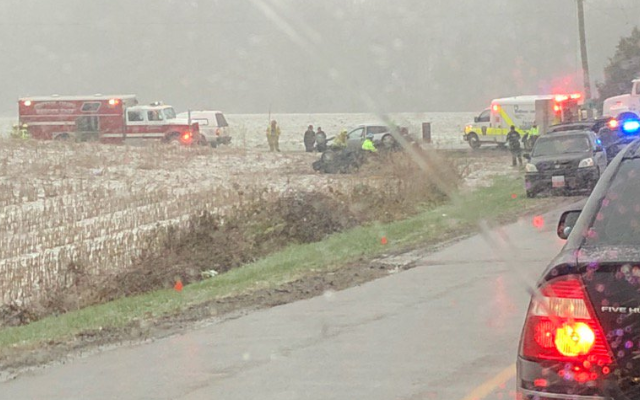 Six people were taken to hospital after a two-vehicle crash east of Strathroy on Friday. Strathroy-Caradoc police say an SUV and car collided at the intersection of Glengyle Dr. and McEvoy Rd. around 8 a.m. The car ended up on its roof in a farmer’s field due to the force of the crash. Four people from the car and two people from the SUV were taken to hospital. The extent of their injuries has not been released, but they are believed to have been non-life threatening. Police are asking anyone who may have witnessed the collision to call them. The investigation into the cause of the crash is on-going. Police aren’t speculating on whether Friday morning’s snowfall played a role in the collision.